I had hoped to build and install Open MPI  as I did MPICH; however, I had problems building it on the RPi2. You can read the Open MPI mailing list  about the issues. To have a second MPI library, I decided to install the default Open MPI libraries that come with Raspbian. By default, Open MPI tools are installed in the standard $PATH (e.g., /usr/bin, /usr/lib/, /usr/include). When environment modules are created, you need to take care with these paths. I talk more about this in the next section. Another indispensable tool for HPC systems is environment modules. Environment modules allow you, the user, to specify which compilers you want, which libraries you want (perhaps built with the same compilers), or anything else you can do to manipulate the user environment. Environment modules are important because you could have one application built with a specific compiler and another application built with a different compiler. Without environment modules, you would have to reconfigure your user environment before running either application. Because all of the nodes need Lmod all the time, it is installed in /work rather than a private directory. Be sure you either log out of your RPi2 or start another shell for these changes to take place. Once you have done this, you need to create your module hierarchy. Figure 3 shows the directory layout. Anything marked with f indicates a file. The Lmod modules are in a shared NFS directory, /work/modulefiles, so that all nodes have access to them. By default, Lmod starts by looking in the Core directory, where the compilers and any applications that are not dependent on a compiler or an MPI library reside. After a compiler or application module is loaded, the compiler branch of the tree becomes active. Modules in this branch are dependent on the compiler. 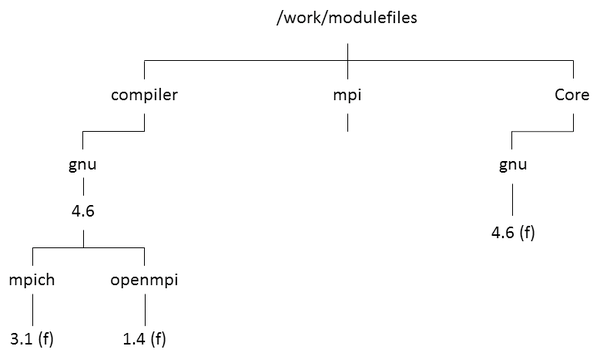 The mpi branch contains applications or tools that are dependent on the compiler/MPI combination. In the HPC world, parallel applications are commonly based on MPI libraries, so the module files for these are in the compiler branch. For this project, I'm using two: one each for MPICH and Open MPI. The first module file is for version 4.6.3 of the GNU compiler. Recall that compilers are installed in the standard $PATH; therefore, you have to be careful about adding anything to $PATH so that if the module is unloaded, the standard $PATH won't be compromised. Listing 6 is the compiler module file I used for this project. 22 local version = "4.6"
23 local base = "/usr/bin/"
MPI implementations are based on specific compiler versions. The first MPI module file listing is for MPICH version 3.1.4. The other module is for Open MPI version 1.4.5, which comes standard with Raspbian, so you have to be very careful about manipulating the standard environment variables. The code I used for the mpich/3.1 and the openmpi/1.4 modules is available at the Raspberry Pi Geek website . Once the modules are in the /work/modulesfiles directory, you can test Lmod with the command module avail (short for "module available") (Listing 7). You can now "load" the various modules. To begin, load the compiler (Listing 8). Notice that Lmod only presents the modules that match the compiler that is loaded. In this case, that is mpich-3.1 and openmpi-1.4. When the mpich-3.1 module is loaded (Listing 9), notice that the mpicc, mpif77, mpif90, and mpirun point to the correct binaries. modules matching any of the "keys". The Raspberry Pi makes an ideal LAN server; connect several Rasp Pis and a low-cost root server, and you have a cluster before you know it. The Raspberry Pi is a great web development tool for building home web servers, allowing you to experiment with Linux packages and test scripts locally before moving them to a production server. The FHEM home automation software is not yet part of the Raspbian package sources. We show you how to install it manually on a fresh Raspbian system.